One question that we deal with often is how to control the Atari Punk Console remotely. It is possible to use pins 3 and 11 of the 556 IC for CV input voltage, however that requires tweaked voltages to work correctly and some synth gear can provide that, but what if you play guitar. Well you are in luck and this mod is very simple. 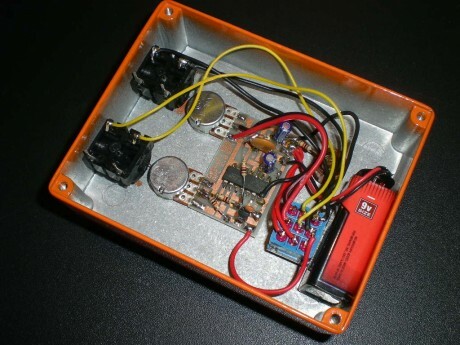 The basic idea of this mod is that you are using the volume potentiometer to control the frequency of the APC. Obviously this is not the same as turning the notes played on the guitar fretboard into the APC oscillations, however it is a pretty good way to control your APC remotely. 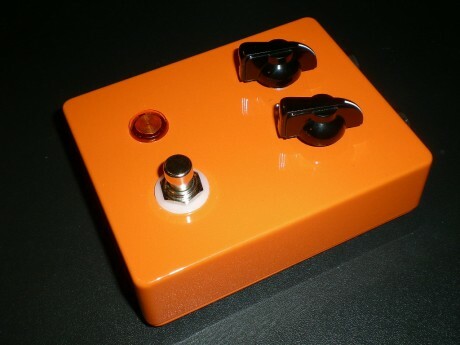 Note that this will not work with a guitar that has an active pre-amp, it has to be the analog un-powered version and obviously it has to be the first in the chain of pedals. 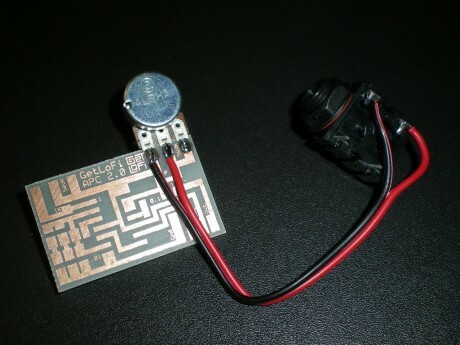 This is similar to the modification done by Properboy with extending the optical sensor in an earlier post. 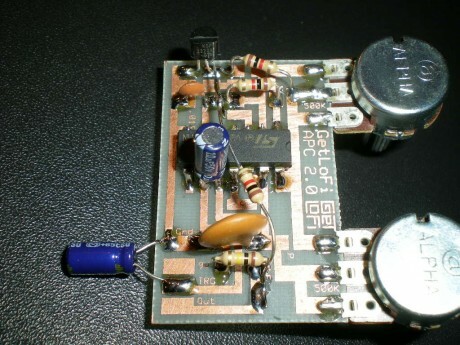 The tricky part is making this circuit into a guitar pedal. This part is not simple because most guitarists want whats called True-Bypass. The ability to stomp on the switch and select between the clean Guitar signal and the effect, whatever that may be. First problem we had to solve was the fact that the APC output is so much louder than the guitar signal. The solution is to remove the standard 10uF output cap, drop the signal via 100k resistor and then route part of the output from the APC to Ground via a 1K resistor. This creates a simple voltage divider, but then we run into a problem. When you go to bypass the Input jack directly into the Output jack, the voltage divider is still attenuating the signal! Simple fix if you have a 4PDT switch, but most stomp switches are 3PDT. Not to worry! Our friend NPN PN2222 Transistor to the rescue. The Collector is wired to Ground and the Emitter is connected inline with a 1K resistor to the output jack tip pin. To turn on this simple circuit connect another 1K resistor between the Base and the Positive power supply. When the APC circuit is powered on by the Bypass switch our transistor faithfully completes the ground circuit and viola! Only pulls down when the volume drop is needed. Next step address horrible clicking noise from switching the APC circuit ON and OFF from bypassing the signal. A couple of 1.0uF electrolytic capacitors ought to do the trick. First one is connected to the Ground and the Positive, the second one is from output of the APC to the Positive. The clicking is not 100% gone, but much much better. So there you have it! GetLoFi APC 2.0 Kit turned into a Stomp Box pedal effect aka the Atari Punk Pedal. Currently is no good schematic, but based on the description and the closeup shots it should be easy to figure out. It might be prudent to even have a variation of the APC PCB accommodating these additional components. Enjoy.